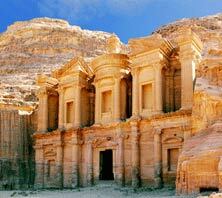 Enjoy the sights as you cruise and visit Rhodes, Jerusalem, Aqaba, Luxor, plus many more! important waterways connecting the Mediterranean Sea to the Red Sea through the Isthmus of Suez. Depart North America for an overnight flight into Barcelona, Spain. Another day at sea. Another chance to explore the "Voyager". The 193.30 km (120 miles)-long Suez Canal is an artificial sea-level waterway located in Egypt and connects the Mediterranean Sea with the Gulf of Suez, a northern branch of the Red Sea. Officially opened in November 1869, the Suez Canal is one of the most heavily used shipping routes in the world, witnessing the passage of thousands of vessels every year. The canal, which separates Asia from the African continent, offers a shortest maritime route between Europe and the regions that share a border with the Indian Ocean and the Western Pacific Ocean. The journey from Europe through the Mediterranean Sea and the Red Sea, transiting through the Suez Canal, cuts around 7,000 kilometres off the journey compared to the one carries out through the South Atlantic and southern Indian oceans. The canal also connects the Port Said in northeast Egypt with Port Tewfik at the city of Suez in the south. Cross the Nile to the famed Valley of the Kings and the magnificent tomb of Tutankhamen and the huge mortuary temple of Queen Hatshepsut. 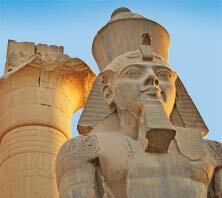 In the evening, witness the fabulous sound and light show at Karnak. Take a jeep safari into the desert to a Bedouin settlement for sweet tea and flatbread and enjoy the dramatic beauty of the sunset over the sands. Overnight aboard "Voyager". Buy lovely hand-painted papyrus copies of tomb paintings, mother-of-pearl inlaid boxes, alabaster trinkets, jewelry, and replicas of ancient artifacts. Enjoy sizzling lamb dishes, falafel, and myriad other Middle Eastern and Egyptian specialties. A day at sea to check over your memories and relax after these days at sea. Another day to explore and enjoy the moments aboard "Voyager". Located between Africa and Asia, it forms the natural separation between the countries of Somalia and Yemen. Gulf of Aden waters flow into the Red Sea through the Bab el Mandeb (strait), and because it provides an outlet to the west for Persian Gulf Oil, it's now one of the world's busiest shipping lanes. The biggest river flowing into the Sea is the Indus River. The Arabian Sea has two important branches — the Gulf of Aden in the southwest, connecting with the Red Sea through the strait of Bab-el-Mandeb; and the Gulf of Oman to the northwest, connecting with the Persian Gulf. The Arabian Sea is a sea between Arabian Peninsula and the Indian peninsula. It covers around 4,600,000, km. The Arabian Sea one of the warmest seas. Disembark this morning and transfer to the airport for your flight back to North America. Ask about extending your time in Dubai.